The new Lenses for cats and their humans reside in the carousel alongside all of the AR experiences designed for just for humans. Users can identify the cat AR experiences by a blue paw print icon on the Lenses icon (if the image of a cat in the icon wasn't enough). Three Lenses are available at the moment, though your mileage may vary (my carousel only has two). Snapchat not only announced the new Lenses via Twitter on Friday, but also changed its profile pic to a ghost cat. Emails to Snap about the Lenses were not returned as of this writing, but, really, there's not much more to this from a technical standpoint. 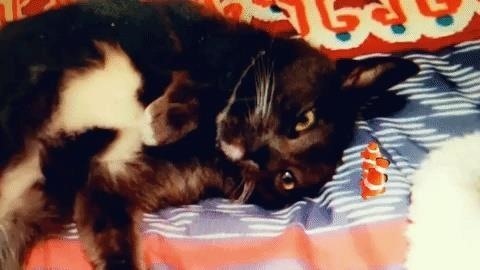 The company already has facial recognition down, so it would be logical to assume that cat recognition would be easier with less variance for a computer vision algorithm to crunch. Google has also shown that it's adept at training machines to recognize animals, as evidenced by its pet identification assistant in Google Photos. Judging by searches for "Snapchat cat" on Twitter and Instagram, the decision to cater to cats in AR was purrfect. 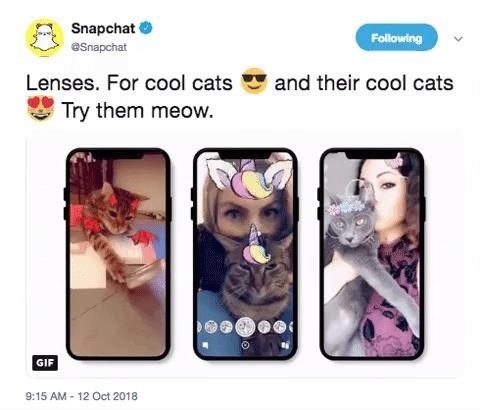 Coming a week after Snap CEO Evan Spiegel admitted to employees that the Snapchat redesign didn't really work out as planned, the new feline Lenses come as a welcome distraction for frustrated Snapchat users, because the Internet loves cats. However, while some may be willing to forgive, others remain cynical. Spiegel also proclaimed that the company would make leadership in AR a key objective in 2019, also noting that Spectacles will play a role in the transition from smartphones to smartglasses. "We're focused on three core building blocks of augmented reality: understanding the world through our Snapchat camera, providing a platform for creators to build AR experiences, and investing in future hardware to transcend the smartphone," said Spiegel. So, as silly as "AR Lenses for cats" sounds, it certainly aligns with the category of understanding the world via your camera device, and a fits nicely alongside other recent innovations in Snapchat's capabilities, including speech recognition, sound recognition, and visual search. Ultimately, the sum of these capabilities will become the foundation of Snap's inevitable evolution into a smartglasses maker.